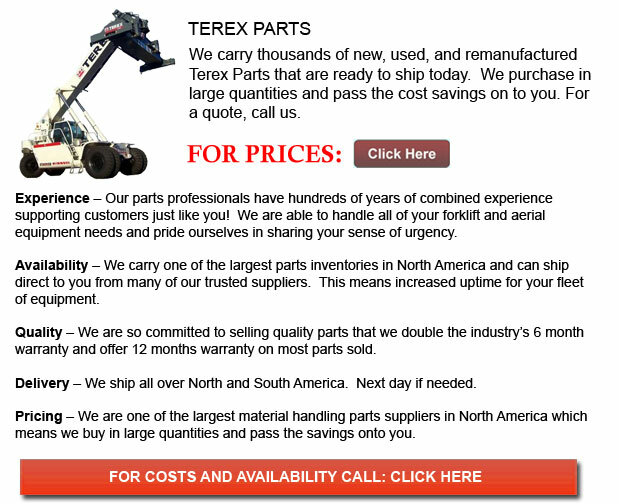 Terex Parts - Terex Forklifts takes immense pride in producing quality equipment that helps better their customers' efficiency while standing by their goal to provide a cost effective yet consistent product line. Through numerous divestures and acquisitions planned to expand the product offering, Terex has of late expanded dramatically. They have enhanced their geographic coverage to enable them to deliver quality standards and value for their broad customer base. Remaining a aggressive player in the industrial equipment sector, Terex is building a franchise under the Terex name brand. The business is incorporating their earlier brand names for a lot of their items in conjunction business the Terex brand name for a smooth transition process. Currently, Terex products are principally marketed under the Terex brand name. A few of the following historic brand names and transitional names include: ATC, Amida, American Truck Company, American, Advance, Bartell, Benford, Bendini, Bid-Well, CMI, CMI-Cifali, CMI Johnson-Ross, Cedarapids, Canica, Comedil, Demag, ELJay, Franna, Fermac, Finlay, Fuchs, Genie, Hi-Ranger, Jaques, Load King, Morrison, O&K, Peiner, PPM, Powerscreen, Pegson, Reedrill, Schaeff, Simplicity, Standard Havens, Tatra, TerexLift, Telelect and Unit Rig. Terex has had a consistent evolution sequence. In 1995 Terex acquired PPM Cranes, in 1996, then Terex divested Clark Materials Handling. In 1997 Terex acquires Telelect and Simon-RO. BPI Handlers in Baraga, Michigan is also acquired this same year. Buying O&K Mining and Payhauler in 1998, enabled Terex to mature their mining operations. The same year their crane offering expanded their operations greatly with the acquisitions of Gru Comedil, TerexLift, American Crane and Peiner. A Light Building business soon followed in 1999 when Terex acquired Amida, Bartell and Benford. They soon became a leader within the crushing and screening market by purchasing Cedarapids, Powerscreen, BL Pegson, Re-Tech, and Finlay. Franna, Kooi and Princeton crane suppliers were also added to Terex in 1999. By acquiring Fermac, a specialized producer of tractor loader backhoes, in the year 2000, Terex expanded into the Compact Equipment marketplace. Their Light Construction operations continued to expand operations with the acquisition of Coleman Engineering. This same year, Terex divested Moffett, Kooi and Princeton. Several purchases in 2002 placed Terex among the leaders in their respective categories. Terex became a primary crane company as Demag fills out the Terex Cranes product offerings. Advance Mixer places Terex within the concrete mixing industry. Acquiring German manufacturers Fuchs and Schaeff placed Terex in a top position in the Compact Equipment class. Genie became a primary manufacturer of Aerial Work Platforms. This busy year was completed operations with the acquisitions of EPAC and Pacific Utility, which offered company-owned distribution for Terex Utilities. A company called Tatra was purchased in 2003. This company produced heavy duty vehicles for armed forces and off-road commercial functions. Buying Combatel and Commercial Body the same year enabled Terex to continue to expand its company-owned Terex Utilities supply. In 2004, Terex acquired Reedrill, a maker of surface drilling equipment for use within the construction, utility and mining markets. Noble CE, which was referred to as Terex Mexico was also acquired this year. They produce high capacity surface mining trucks and also produce many components for other Terex businesses.